English spurs with brass 9 point end & side rowels. 5/16" wide band, 3/4" neck, 3" opening & square ends for spur straps. Brand unknown. A hard to find English spur. Prince Of Wales Spurs(POW) with 7/8” neck. Rubber coated Prince Of Wales Spurs(POW) with ¾” neck. Rubber reduces slipping. Prince of Wales(POW) type spurs, can be used for Dressage or any other English discipline. 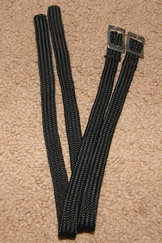 3 3/8" opening, 1/4" wide band, approx 4" deep, & 1/2" neck. Marked Never Rust Germany inside band. Does not react to a magnet. Some corrosion on knob, minor corrosion on band in knob area. Single spur only. 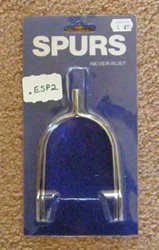 Use as a replacement for a lost or broken spur, use for crafts or decorations. Humane Spur with Nylon Strap set Great little spur that’s just enough without being too harsh. Comes with woven nylon spur straps. Extra long necks with slightly curved ends. Guaranteed to wake your lazy horse up! Stainless steel, Prince of Wales. The Hammer Heads have a squared edge. Lots of people love these spurs because they are angled so they don't squash your foot when you wear them. These spurs are constructed of stainless steel with 5/16'' neck with blunt end & rounded spur strap slots. 3” wide opening, approx 3 1/4” deep, 1/4” rounded band. Not marked but may be Korsteel & are in excellent condition. 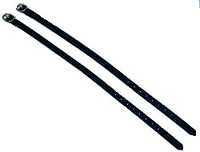 Quality leather spur strap for work or show. Roller buckle. A great spur strap at a great price. Leather spur strap for work or show. Rounded buckle. A great spur strap at a great price. Chrome plated POW style English spurs with 5/8” neck(15mm) & comes with pair of black nylon spur straps. Great schooling or starter spurs with straps. This spur has a 1 1/8'' neck with smooth blunt knob end, squared spur strap slots. 3” wide opening, approx 4” deep, 1/2” flat band. Stamped HS. Does not react to magnet so should be stainless steel. Single spur only. These spurs are constructed of stainless steel with 1 3/8'' neck with 9 point rowel for overall length of 1 5/8”, with squared spur strap slots approx 11/16" wide. 3” wide opening, approx 4” deep, 1/2” rounded band. The rowell is designed to roll along the side of the horse & offer gentle encouragement. Brand unknown, possibly Korsteel, but entire spur is stainless including the rowel. Comes with 1/2" wide black leather spur straps that are supple & in excellent used condition.